The Mid-Island Manifestors developed a project titled “Toolbox for Change, A Local Perspective on Indigenous Culture”. The original goal of the project was to break through cultural stereotypes (specifically in local businesses) and cultivate reconciliation by connecting with local Indigenous people. It was recognized, through discussions with stakeholders, that although schools are now teaching about First Nations culture and history, there was a lack of education for previous generations. The generations that needed to be reached are the generations that own or work in many of the region’s local businesses. 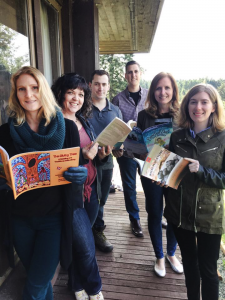 In order to achieve the goal of breaking through stereotypes and cultivating reconciliation, a travelling toolbox was created to welcome readers into the world of local Indigenous culture. 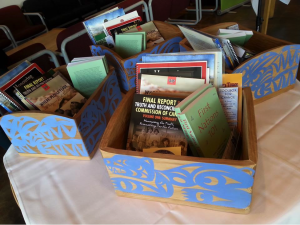 The books included in the toolbox were provided by Strong Nations bookstore, owned and operated by Terri Mack. The team suggested some topics and Terri handpicked the books to include in the box. Her selections ranged from children’s storybooks, to cookbooks, to educational books about First Nations culture. 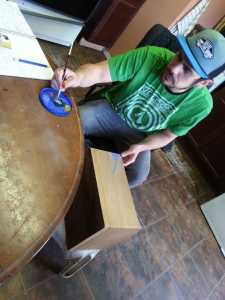 The Toolbox was then designed and fashioned by Coast Salish artist Joel Good of Nanaimo. In total, seven boxes were constructed with the intent of being displayed in local business lobbies or break rooms for clients and staff to peruse at their leisure. Two of the boxes will rotate through local businesses on a monthly basis. 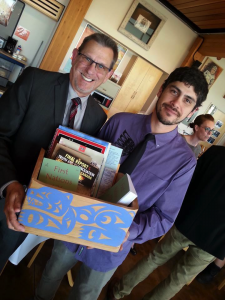 The Nanaimo Aboriginal Centre, the community partner for the project will become the caretaker of the boxes and ensure they are able to move seamlessly through the community. The two travelling boxes made their first stop at Nanaimo News Bulletin and the Boys and Girls Clubs of Central Vancouver Island in May 2016. 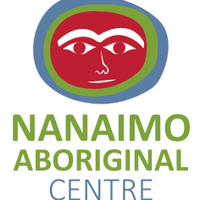 A big thank you to the Nanaimo Aboriginal Centre. Chris Beaton played a critical role as the community partner, offering support throughout the entire project. The team would like to give special thanks to Western Forest Products, whose generous financial support made this project possible.